Creating a blended learning environment with multiple opportunities for learners to engage in a wide array of formats and modalities is the critical piece to connecting the learning strategy to business outcomes. Organizations need to develop and deploy multiple strategies in concert with each other to achieve their goals. There’s an overall business strategy, a marketing strategy, a sales strategy, a product strategy, and others. But the learning strategy, which should be an integral part of this mix, is not a top priority for most organizations. It sits in last place when assessing the importance of strategies to achieve business success, according to Brandon Hall Group’s 2018 research. The learning strategy may be seen as unimportant because organizations are not good at implementing it. Seventeen percent of those surveyed don’t even have a learning strategy in place. Among the rest, less than one-third of organizations say their learning strategy is either effective or very effective in achieving business goals. Companies struggle to create and deploy learning programs that meet employees’ performance needs, making it difficult to impact business goals, which makes the learning strategy ineffective. Organizations must tackle this problem from both ends by developing learning strategies aligned with the business and creating learning experiences that impact performance. Fewer than half of the companies surveyed believe their learning strategy is even decently linked to the overall business strategy; just 7 percent say that it is well aligned. 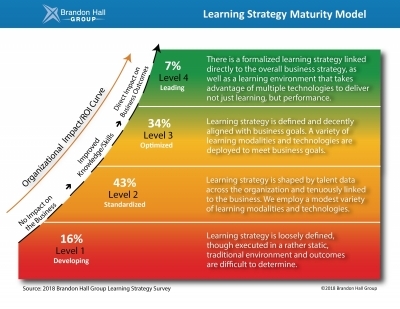 Brandon Hall's Learning Strategy Maturity Model (which also can be downloaded at the end of this article) only includes organizations with a learning strategy, ignoring the 17 percent that do not have one. Sixteen percent of the strategies aren’t really defined and are not linked to business outcomes. An elite group (only approximately 7 percent) has a formalized learning strategy aligned with the business—and the analytics to back it up (Level 4). Within this group, 79 percent say their L&D strategy is either effective or very effective in helping to achieve business goals, which is a stark contrast to Level 1, where only 14 percent say their strategy is effective and zero say it is very effective. Without proper alignment, there is no way to ensure learning is effective. In fact, there is no way of knowing if it will be effective before it is delivered. The best a company can hope for is to deploy a great program and get lucky in producing results. This becomes evident when we look at the challenges companies face in achieving critical learning outcomes. Lack of alignment so evident in many learning strategies. Not only are organizations unable to properly link learning to outcomes before the learning is even developed, they also are have difficulty demonstrating the link once it’s been delivered. This data indicates that even the best learner experience with the best learning content, delivered to the most engaged learners, still will not be able move the needle on outcomes without proper alignment. Though aligning the learning strategy with the business is considered important or critical by 78 percent of companies, only 18 percent say they are ready to act. What can be done to help create a more robust learning strategy with a connection to the business? Understandably, the robustness of the learning strategy extends through the actual delivery of learning, as high-performing Learning functions deliver far more effective learning than lower-performing ones. Organizations with robust, mature learning strategies do a far better job of delivering a well-rounded, blended learning experience than their lower-level counterparts. Creating a blended learning environment with multiple opportunities for learners to engage in a wide array of formats and modalities is the critical piece to connecting the strategy to business outcomes. Brandon Hall Group’s Learning and Performance Convergence Model outlines how to create alignment from desired business outcomes through learning measurement. The model should help companies create a fluid, blended approach to learning focused on specific outcomes aimed at changing how people work to improve the business. The learning strategy must be informed by desired business outcomes. By identifying specific outcomes, companies can define the knowledge, skills, and behaviors to help achieve those results. The knowledge, skills, and behaviors become the objectives for the learning programs. This is the critical piece. Most organizations with ineffective strategies start with objectives before determining the critical desired outcomes, and the behaviors and skills that need to change. The mix of learning types will change from program to program, depending on the desired outcome. This is another stumbling block for many organizations; determining modalities before outcomes, changes needed to reach the outcomes, and the learning objectives. A program can include elements of all three learning types, or maybe just two. It depends; some programs might require almost all formal learning, while others can focus more on experiential. Were the learning objectives achieved? Was a skill or knowledge acquired? This type of measurement keeps learning tightly aligned with the business, as opposed to metrics such as completion rates and smile sheets, which only measure the learning itself. David Wentworth is principal Learning analyst at Brandon Hall Group, an independent research/analyst firm in the Human Capital Management market. The firm’s vision is to inspire a better workplace experience, and its mission is to empower excellence in organizations around the world through its research and tools. Brandon Hall Group has five HCM practices, and produces the Brandon Hall Group Excellence Awards; the Women in Leadership Summit, June 6-7 in Fort Lauderdale, FL; and the annual HCM Excellence Conference, held Jan. 22-25, 2019, in West Palm Beach, FL.